Earn up to 2,640 reward points. Special bracing and top-quality tonewoods pair up for a guitar that is sure to please. Alvarez dreadnoughts are powerful and wonderful guitars to play with great quality tone from bass to sparkle and everything in-between. 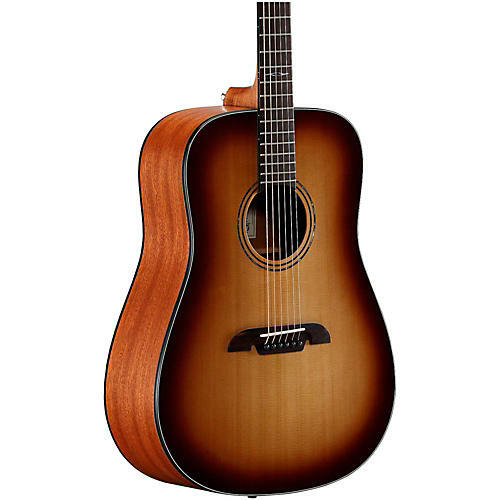 The AD60SHB has a mahogany body to delivers strong mids and a warm, articulate sound with high-end cosmetics, while the hand-selected quartersawn solid A+ Sitka spruce top is stiff and strong, ready to project for years to come. The AD60SHB Dreadnought is part of the Artist Series, now “The Award Winning Artist Series” – winning competitions and receiving rave reviews in the States, Europe and around the world. It’s a truly designed line of guitars that stands tall and sounds sweet in the solid top guitar market with hand-selected solid tops and forward shifted scalloped bracing which offer up awesome tone and player experience. Each Artist Series model is designed to get the best out if its components, and for them to work together to produce a tone and player experience, rarely found in affordable instruments. These components include Alvarez's FST2M bracing system, bi-level bridge, real bone nut and great quality tonewoods. FSTM is a forward shifted X brace design. Both the X braces and asymmetric tone bars are scalloped. Moving the system forward allows for a larger soundboard, which is optimized with a solid maple bridge plate for both strength and energy. Order this high-performance dreadnought today!